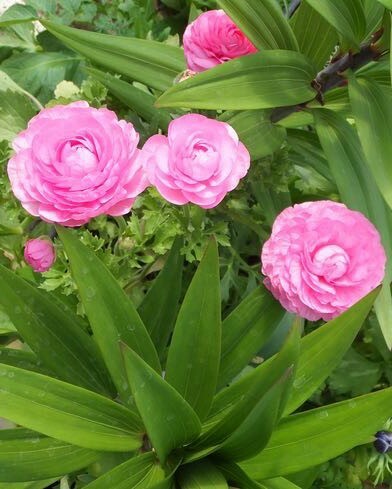 The beautiful flowers of Ranunculus asiaticus have been cultivated for centuries and are especially good for growing in modern frost free greenhouses. With their long stems and perfect form their blooms are both excellent for cutting or adding colour to a foliage display especially in early and mid summer. Credited with coming from Persia these are found wild from South West Europe throughout most of the Middle East. Known and grown since Classical times the original Turkish or Double Turban forms were re-selected and bred in the middle of the 19th Century in France to give the semi-double ‘French’ strain (which usually carry a blotch in each bloom). Then fifty years later in Italy the first fully double Paeony flowered strain was developed. 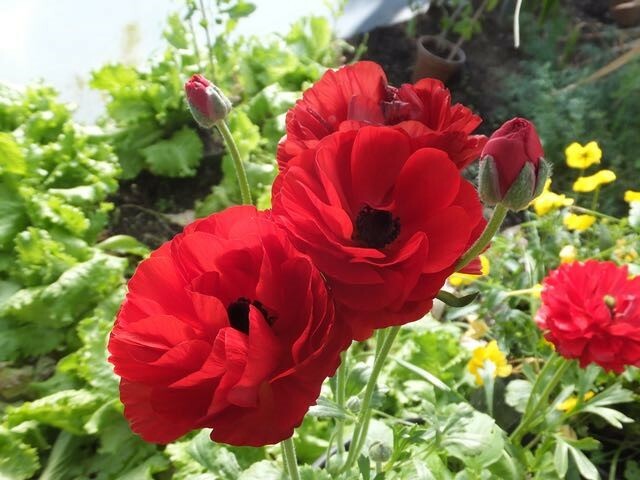 As with so many plants these can be grown from seed to give reasonable results but you really need to buy your first plants of the best varieties. These come as strange black tuberous roots with claws that look almost like ghastly pulled teeth. You plant these an inch and a half (3-4cm) deep individually in litre pots of gritty leaf-mould-rich loamy compost. These then need light, cool frost free conditions and moisture but never waterlogging. Watering needs be frequent but sparingly with light feeding until the foliage is growing well then both can be increased until flowering when you back off again. The pots can be stood on the staging but are better down on the floor as long as fully in the light or ideally plunge them in a cool sunny greenhouse border. Once the weather is frost free they can be moved to a plunge bed outdoors to grow on into flowering plants. They are then best returned to the greenhouse before the blooms open to ensure their perfection. A few weeks after cutting the plants will start to die back, withdraw water and dry off by the autumn for storing till late winter when you start them again. At this point if wished offsets can be detached from the original roots and grown on to make flowering size in only a year or so. By growing several strains you can extend the period of cutting, and batches can be started from late autumn till early spring. However the safest time is usually late winter, indeed right now. Interestingly another Persian species, R. edulis (known as Egg-yolk from the colour of it’s flowers) is according to Sturtevant eaten in spring, the tubers together with the stems were cooked for food, think I’ll give that a pass.